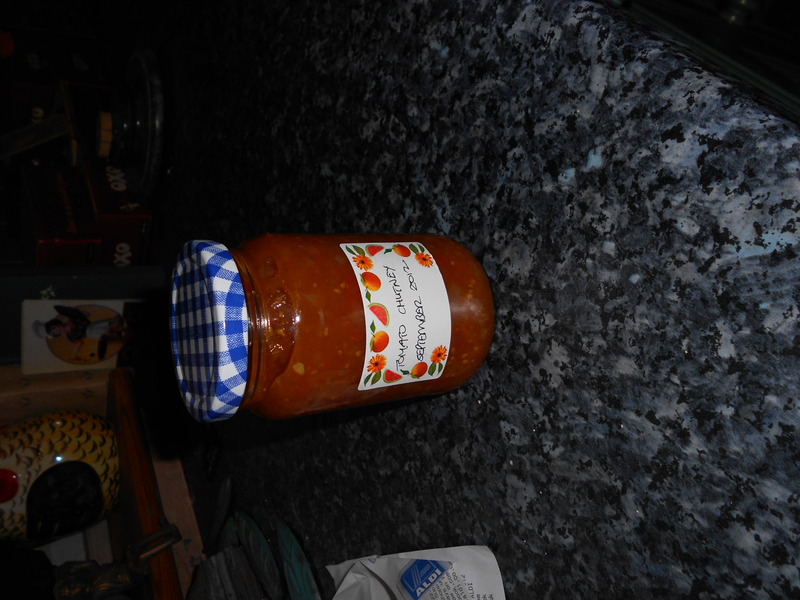 I get through a lot of ‘red tomato chutney’ so stocking up with this year’s tomatoes was a priority. This year I have made it in batches of 2lb of tomatoes as they ripened, rather than waiting to make a larger quantity at a time, and I got it off to an art by the time I reached the 6th batch! It is meant to be suitable green tomatoes as well, but I haven’t tried it. The recipe came from a Margaret Patten’s ‘500 Recipes for Jams, Pickles, Chutneys’ (Hamlyn), which cost 35p in the 1970s. The recipe gives a cooking time of 40 minutes for ripe tomatoes, 50-55 for green tomatoes, but I would say it takes longer if you want to make sure your chutney is not too runny. Apologies for recipe only being in imperial units! 7. Remove bag of spices and put in sterilised jars in the usual way.